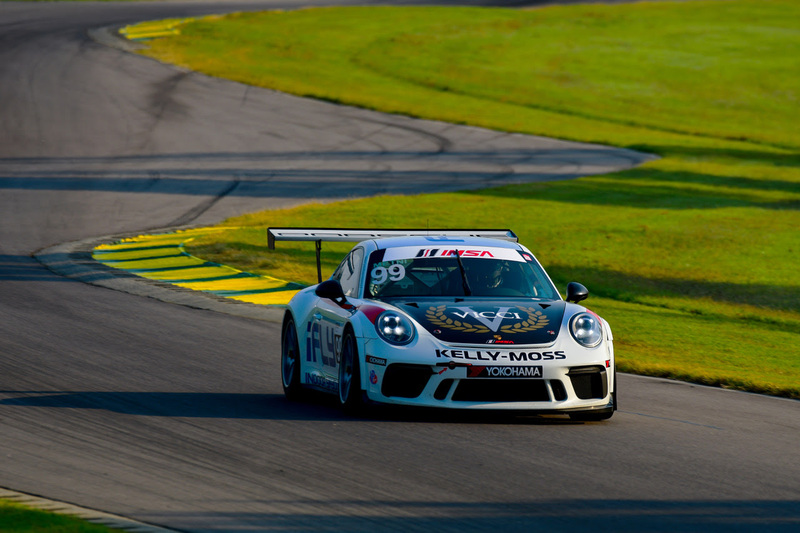 Danville, Va. (21 August, 2018) – Kelly Moss Road and Race driver Roman De Angelis kept his IMSA Porsche GT3 Cup championship hopes alive with a third-place finish in Round 12 on Sunday at Virginia International Raceway. 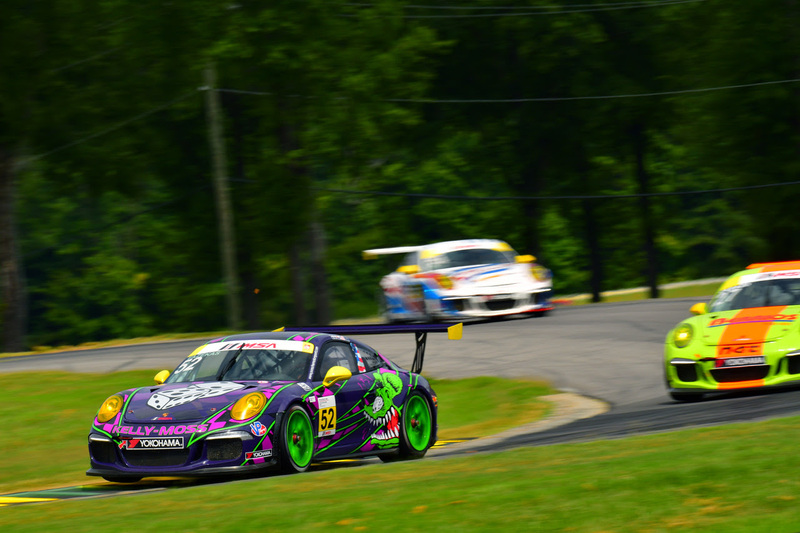 Danville, Va. (21 August, 2018) – KellyMoss Road and Race driver Roman De Angelis kept his IMSA Porsche GT3 Cup championship hopes alive with a third-place finish in Round 12 on Sunday at Virginia International Raceway. De Angelis also finished fifth in the Saturday event during the Michelin GT Challenge, and will look to continue to reduce the 24 margin to the leader through the final four races of the 2018 season. Competing in the Platinum Cup, which showcases the latest-generation 2017-18 Porsche GT3 Cup car, the 17-year-old resident of Belle River, Ontario, scored his seventh podium finish of the campaign in the second 45-minute sprint race of the weekend on the 3.27-mile circuit. Alan Metni of Austin finished ahead of points leader Charlie Luck in the Platinum division Masters class in both races at VIR. Driving the No. 99 iFly/AM Motorsports/VICCI Auctions Porsche, Metni finished seventh in the opening round after a late incident while battling Luck for the class lead. He then placed fourth in the Sunday race. A two-time Masters winner this season, he now trails Luck by 13 points, 358-345. In the Gold Cup class for cars from model years 2014-16, Greg Palmer scored his first podium finish of the season. 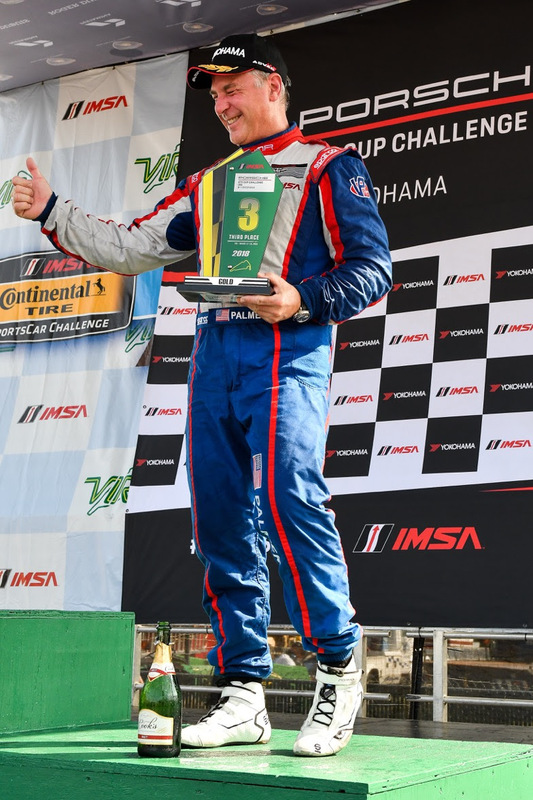 He took third in the second race at VIR after finishing fourth in the opener. Palmer earned the Yokohama Hard Charger award for Sunday’s efforts for improving the most overall positions in the event. Kurt Fazekas of Indianapolis saw his race winning efforts go unrewarded on Saturday as he fought in the closing laps but suffered an off-track excursion while battling with eventual winner Victor Gomez IV for the lead of the race. Fazekas was treated and released from the circuit’s infield care center, but the car suffered enough damage to force the multiple race winner to miss the Sunday round. Kelly Moss Road and Race is second in the Gold Cup Team standings, trailing 405-381. Scott Welham of Louisville, Ky., was entered but did not compete following some bad racing luck at Road America, where a car spun directly in front of him and he was unable to avoid significant damage to his distinctively liveried No. 61 entry and prevented him from racing at VIR. He remains eighth in the Masters points. Two weekends remain on the 2018 schedule. The series visits Sonoma (Calif.) Raceway for a pair of 45-minute sprints on Sept. 15-16, and then wraps up the season at Road Atlanta on Oct. 11-12 during the Motul Petit Le Mans.